Many who regularly occupy church pews, fill church rolls, and are intellectually acquainted with the facts of the gospel never strike one blow for Christ. They seem to be at peace with his enemies. They have no quarrel with sin and, apart from a few sentimental expressions about Christ, there is no biblical evidence that they have experienced anything of the power of the gospel in their lives. Yet in spite of the evidence against them, they consider themselves to be just what their teachers teach them — that they are ‘Carnal Christians’. And as carnal Christians they believe they will go to heaven, though perhaps not first-class, and with few rewards. That something is seriously wrong in lives which reveal such features will readily be admitted by most readers of these pages; no argument is needed to prove it. But the most serious aspect of this situation is too often not recognized at all. The chief mistake is not the carelessness of these church-goers, it is the error of their teachers who, by preaching the theory of ‘the carnal Christian’, have led them to believe that there are three groups of men, — the unconverted man, the ‘carnal Christian’ and the ‘spiritual Christian’. My purpose in this essay is to argue that this classification is wrong and to set out the positive, historic, and biblical answer to this ‘carnal Christian’ teaching. The argument from Church history is not unimportant, for it is a fact that less than two-hundred years ago this teaching was unknown in the churches of North America, but I am concerned to rest my case on an honest statement of the teaching of the Bible. I have written after study, private meditation and prayer, and after using many of the old respected commentaries of another day, but my appeal is to the Word of God and it is in the light of that authority that I ask the reader to consider all that follows. In matters of controversy it must ever be kept in mind that a Christian’s experience may be genuine even though his understanding of divine truth is tainted with error or ignorance. The opposite is also possible — a man’s intellectual understanding may be good and his experience poor. I pray that if I am in error on this or any other doctrine I shall be corrected before I leave this world. I trust I am willing ever to be a learner of divine truth. I know that one of my motives is the same as that of many who hold this erroneous view, namely, to advance biblical holiness and to seek to ‘adorn the doctrine of God our Savior’. To accomplish my purpose it is of the greatest importance that the whole subject should be set on a proper foundation. I do not want to make a caricature of the view of others and then demonstrate success by tearing it apart. I shall also seek to avoid disproportionate and one-sided statements. The danger that we may ‘darken counsel by words without knowledge’ is still with us. I pray that this effort will elicit truth and that the existence of varied opinions will lead us all to search the Scriptures more, to pray more, and to be diligent in our endeavors to learn what is ‘the mind of the Spirit’. 1. Are we sanctified passively, that is, ‘by faith’ only, without obedience to the law of God and Christ? If sanctification is passive — a view represented by the slogan ‘Let go and let God’ — then how do we understand such apostolic statements as ‘I fight’, ‘I run’, ‘I keep under my body’, ‘let us cleanse ourselves’, ‘let us labor’, ‘let us lay aside every weight’? Surely these statements do not express a passive condition, nor do they indicate that by one single act we may possess the experience of ‘victory’ and thus become spiritual and mature Christians. 2. Does an appeal to the so-called ‘carnal Christian’ to become a ‘spiritual Christian’ minimize the real conversion experience by magnifying a supposed second experience, by whatever name it may be called — ‘higher life’, ‘deeper life’, ‘Spirit-filled life’, ‘triumphant living’, ‘receiving Christ as Lord, and not merely as Savior’, and so on? The words we read in 2 Corinthians 5:17, ‘Therefore, if any man be in Christ, he is a new creature: old things are passed away; behold, all things are become new’, do not refer to a second experience but rather to what happens when any real conversion occurs. 3. Has the ‘spiritual Christian’ finished growing in grace? If not, what is he to be called as he continues to grow in grace? Do we need to make yet another class whose members are the ‘super-spiritual Christians’? 4. Who is to decide who the carnal Christians are, and exactly what standard is to be used in determining this? Do the ‘spiritual Christians’ decide who the ‘carnal Christians’ are? Does a church or preacher decide where the line is to be drawn that divides the two classes or categories? Since all Christians have sin remaining in them, and since they sin every day, what degree of sin or what particular sins classify a person as a ‘carnal Christian’? In Romans 8:1-9 there is a division stated, but it is not between carnal and spiritual Christians. It is a division between those who walk after the flesh (the unregenerate) and those who walk after the Spirit (they that are Christ’s). There is no third category. Again, in Galatians 5:17-24 we have only two classes or categories — those that do the works of the flesh and those that are led by the Spirit. There is no third or fourth class or group. In all these sources there is not one trace of the belief that there are three classes of men. 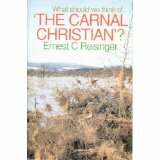 All of them have much to say about carnality in Christians, and about the biblical doctrine of sanctification and its relationship to justification, but there is no hint of the possibility of dividing men into ‘unregenerate’, ‘carnal’ and ‘spiritual’ categories. If the sources I have named had come across the ‘carnal Christian’ theory, I believe that with one voice they would have warned their readers, ‘Be not carried away with divers and strange doctrines’ (Hebrews 13: 9). We live in a day when there are so many books and such a variety of teaching on the subject of the Christian life that Christians are ‘tossed to and fro’, and liable to be ‘carried about by every wind of doctrine’ (Ephesians 4:14). There is also the Athenian love of novelty and a distaste for the old, well-tested, and beaten paths of our forefathers. This excessive love of the new leads to an insatiable craving after any teaching which is sensational and exciting, especially to the feelings. But the old paths lead to a ‘meek and quiet spirit’ which the apostle Peter commends: ‘But let it be the hidden man of the heart, in that which is not corruptible, even the ornament of a meek and quiet spirit, which is in the sight of God of great price’ (I Peter 3: 4). At a church service that I attended recently, the preacher, a sincere minister, was expounding 1 Corinthians chapter 3, and he said to a large congregation, ‘Now after you become a Christian you have another choice — either to grow in grace, follow the Lord and become a spiritual Christian, or to remain a babe in Christ and live like natural men.’ He used 1 Corinthians 3: 1 — 4 to state that there were three categories of men — the natural man, the spiritual man, and the carnal man. He described the carnal man as being like the natural man who was unconverted. It is very important to observe the two main things in this Scofield note. First, the division of men into three classes; second, we are told that one of these classes of men comprises the ‘carnal’, the ‘fleshly’, ‘the babe(s) in Christ’, ‘who walk after the flesh’. To ‘walk’ implies the bent of their lives; their leaning or bias is in one direction, that is, towards carnality. Second, one class or category is set out as containing the ‘Christian’ who ‘walks after the flesh’. The centre of his life is self, and he is the same as the unrenewed man as far as the bent of his life is concerned. Third, all those who accept this view use 1 Corinthians 3: 1-4 to support it. Consequently, if it can be established that the preponderance of Scripture teaches only two classes or categories of men — regenerate and unregenerate, converted and unconverted, those in Christ and those outside of Christ — the ‘carnal Christian’ teaching would be confronted with an insurmountable objection. It would be in conflict with the whole emphasis of Scripture and of the New Testament in particular. Before I turn to some of the errors and dangers of the ‘carnal Christian’ teaching it may be wise to indicate what I am not saying. In this discussion of the ‘carnal Christian’ theory I am not overlooking the teaching of the Bible about sin in Christians, about babes in Christ, about growth in grace, about Christians who back-slide grievously, and about the divine chastisement which all Christians receive. I acknowledge that there are babes in Christ. In fact there are not only babes in Christ, but there are different stages of ‘babyhood’ in understanding divine truth and in spiritual growth. I also recognize that there is a sense in which Christians may be said to be carnal but I must add that there are different degrees of carnality. Every Christian is carnal in some area of his life at many times in his life. And in every Christian ‘the flesh lusteth against the Spirit’ (Gal. 5:17). All the marks of Christianity are not equally apparent in all Christians. Nor are any of these marks manifest to the same degree in every period of any Christian’s life. Love, faith, obedience, and devotion will vary in the same Christian in different periods of his Christian experience; in other words, there are many degrees of sanctification. The Christian’s progress in growth is not constant and undisturbed. There are many hills and valleys in the process of sanctification; and there are many stumblings, falls and crooked steps in the process of growth in grace. These truths are all acknowledged and are not the point of this present discussion. The question we have to consider is: Does the Bible divide men into three categories? This is the issue at the heart of the ‘carnal Christian’ teaching. First: This ‘carnal Christian’ doctrine depends upon a wrong interpretation and application of 1 Corinthians 3:1-4, ‘And I, brethren, could not speak unto you as unto spiritual, but as unto carnal, even as unto babes in Christ… are ye not carnal?’ To understand the true meaning of these words it should be remembered that 1 Corinthians is not primarily a doctrinal epistle. Like all Scripture it contains doctrine, but it was not written — as was the Epistle to the Romans — to lay doctrinal foundations. Paul’s immediate concern in writing this Epistle was to deal with practical problems in a young church. In the third chapter, and earlier, he is dealing with the danger of division arising out of a wrong esteem for those from whom they heard the gospel. They were looking at second causes and forgetting the God to whom alone all glory belongs. Instead of saying, ‘We are Christ’s disciples’ and recognizing their union in him, they were forming parties and saying, ‘We are Paul’s for he founded the church in our city’; or ‘Apollos is more eloquent than Paul and he edifies us more’; or, ‘We are of Peter’. Thus opposing parties were set up. This is very different from saying that the Apostle here recognizes the existence of a distinct group of Christians who can be called ‘carnal’. When Paul comes to speak of classes, he knows only two, as is clear in chapter 2 of this same Epistle where he divides men into ‘natural’ and ‘spiritual’, and says, ‘But the natural man receiveth not the things of the Spirit of God: for they are foolishness unto him: neither can he know them, because they are spiritually discerned. But he that is spiritual judgeth all things, yet he himself is judged of no man’ (1 Cor. 2:14-15). Under the term natural the Apostle includes all those persons who are not partakers of the Spirit of God. If the Spirit of God has not given to them a new and higher nature then they remain what they are by their natural birth, namely, natural men. Certainly these Christians at Corinth were imperfectly sanctified, as indeed are all Christians to a greater or lesser degree. But Paul is not saying that they were characterized by carnality in every area of their lives. He is not expounding a general doctrine of carnality but reproving a specific out-cropping of carnality in one certain respect. When Paul does state a foundational truth respecting the position of all Christians it is in such words as, ‘If any man be in Christ, he is a new creature’, and for all who are ‘in Christ’ it is also true that, ‘old things are passed away; behold, all things are become new’ (2 Cor. 5:17). There is no place for two classes of Christians in Paul’s letter to the church at Corinth, and indeed no place for it anywhere in the teaching of Scripture. To interpret 1 Corinthians 3:1-4 in such a way as to divide men into three classes is to violate a cardinal rule for the interpretation of Scripture, namely, that each single passage must be interpreted in the light of the whole. It was a wise saying of one of the church fathers, ‘If you have one Scripture only on which to base an important doctrine or teaching you are most likely to find, on close examination, that you have none’. ‘Behold, the days come, saith the Lord, that I will make a new covenant with the house of Israel, and with the house of Judah … I will put my law in their inward parts, and write it in their hearts … I will forgive their iniquity, and will remember their sin no more'(Jeremiah 31:31-34). ‘For I will take you from among the heathen, and gather you out of all countries, and will bring you into your own land. Then will I sprinkle clean water upon you, and ye shall be clean: from all your filthiness, and from all your idols, will I cleanse you. A new heart also will I give you, and a new spirit will I put within you: and I will take away the stony heart out of your flesh, and I will give you an heart of flesh. And I will put my spirit within you, and cause you to walk in my statutes, and ye shall keep my judgments, and do them’ (Ezekiel. 36: 24-27). ‘Whereof the Holy Ghost also is a witness to us: for after that he had said before, This is the covenant that I will make with them after those days, saith the Lord, I will put my laws into their hearts, and in their minds will I write them; and their sins and iniquities will I remember no more’ (Hebrews 10:15-17). It is important to note that this is one covenant with two inseparable parts — the forgiveness of sins and a changed heart. When a sinner is reconciled to God something happens in the record of heaven, the blood of Christ covers his sins. Thus, the first blessing is the forgiveness of sins. But at the same time something happens on earth in the heart, a new nature is given. Well, what is the forgiveness of sins? It is an essential part of the justification of a man before God. And what is a new heart? It is nothing less than sanctification begun. But the ‘carnal Christian’ teaching appeals to those who are supposed to be justified, as though a new heart and life are optional. Sanctification is spoken of as though it can be subsequent to the forgiveness of sins and so people are led to believe that they are justified even though they are not being sanctified! The truth is that we have no reason to believe that Christ’s blood covers our sins in the record of heaven if the Spirit has not changed our hearts on earth. These two great blessings are joined together in the one covenant. The working of the Spirit and the cleansing of Christ’s blood are inseparably joined in the application of God’s salvation. Hence the teaching which calls for an act of submission or surrender (or whatever else it may be called) subsequent to conversion in order that the convert may live the spiritual life, cuts the living nerve of the new covenant. It separates what God has joined together. The third major error is that this teaching does not distinguish between true, saving belief and the spurious belief which is mentioned in the following Scriptures: ‘Many believed in his name … But Jesus did not commit himself to them’ John 2:23,24. ‘Many believed on him; but because of the Pharisees they did not confess him’ John 12:42,43. ‘These have no root, which for a while believe’ Luke 8:13. Simon Magus ‘believed’ and was baptized but his heart was ‘not right in the sight of God’ Acts 8:12-22. In other words, it was ‘belief’ without a changed heart and because this was Simon’s condition Peter says he would perish unless he came to true repentance: he was ‘in the gall of bitterness and in the bond of iniquity’ (vs. 23). And the evidence that Simon Magus was indeed unsaved can be seen in his prayer. He, like all unregenerate people, was only concerned with the consequence of sin and made no request to be pardoned and cleansed from the impurity of sin. ‘Pray ye,’ he says to Peter, ‘to the Lord for me, that none of these things which ye have spoken come upon me’. Like the so-called ‘carnal Christian’ he wanted Jesus as a kind of hell-insurance policy but he did not ask for deliverance from sin! In all these scriptural instances men ‘believed’; they had ‘faith’, but it was not saving faith. And all ‘carnal Christians’ profess their faith but it is not always saving faith. Charles Hodge, following the Scriptures, makes a clear distinction between the different kinds of faith, (1) Speculative or dead faith, (2) temporary faith, (3) saving faith.’ Robert Dabney differentiates, (1) Temporary faith, (2) historical faith, (3) miraculous faith, (4) saving faith.’ The ‘carnal Christian’ teaching makes no allowance for these distinctions, it gives little or no recognition to the possibility of a spurious belief, instead it implies or assumes that all who say they ‘invite Jesus into their lives’ are in possession of saving faith. If these professing believers do not live and act like Christians, their teachers may well say that it is because they are not ‘spiritual Christians’. The fact is they may not be true believers at all! A fourth flaw in the ‘carnal Christian’ teaching lies in its virtual exclusion of repentance from the conversion experience. This is implied by the suggestion that the ‘carnal Christian’ has not changed in practice but lives and acts just like the natural man. This teaching is obviously set forth in the diagram given above where self is still on the throne in the case of those in the second group. But thus to suggest that repentance, including a changed attitude to sin, is not an essential part of conversion is a very grave error. It is to depart from the apostolic gospel. No one who so minimizes the necessity of repentance can say with Paul, ‘I kept back nothing that was profitable unto you, but have shewed you, and have taught you publicly, and from house to house, testifying both to the Jews, and also to the Greeks, repentance toward God and faith toward our Lord Jesus Christ’ (Acts 20: 20, 21). John Cotton, one of the Puritan leaders of New England, was right when he wrote: ‘There is none under a covenant of grace that dare allow himself in any sin; for if a man should negligently commit any sin, the Lord will school him thoroughly and make him sadly to apprehend how he has made bold with the treasures of the grace of God. Shall we continue in sin that grace may abound? God forbid: None that has a portion in the grace of God dareth therefore allow himself in sin; but if through strength of temptation he be at any time carried aside, it is his greatest burden’. The Bible certainly teaches that to make men consider they are Christians when in reality they are not is a great evil, and insofar as the ‘carnal Christian’ theory allows for a whole category of ‘Christians’ whose hearts are not surrendered in obedience to Christ, its tendency is to promote that very evil. Nothing could be more dangerous. Lost, self-deceived souls who should be crying out to God for that supernatural change which is made known to themselves and to the world by a changed heart and life are often found hiding comfortably behind this very theory. As long as they believe it they will never seek a real salvation. Although they profess to hold evangelical truth their position is far worse than that of natural men who know that they are not converted! The ‘carnal Christian’ teaching ignores much biblical teaching on the doctrine of assurance, especially those Scriptures which show that Christian character and conduct have a bearing on our assurance. The short First Epistle of John was written in order that those who believe may know that they have eternal life; that is, may know that they are born of God (5.13). Throughout the Epistle John stresses the marks that accompany the new birth (3:9; 5:18). He shows that a man born again is not at home in the realm of sin, and that disobedience to God’s commandments cannot be the bent of a Christian’s life, as the ‘carnal Christian’ teaching would lead us to believe. ‘For whatsoever is born of God overcometh the world; and this is the victory that overcometh the world, even our faith (5:4). ‘And hereby we know that we know him, if we keep his commandments. He that saith, I know him, and keepeth not his commandments, is a liar, and the truth is not in him. But whoso keepeth his word, in him verily is the love of God perfected: hereby know we that we are in him (2:3-5). From such texts it is clear that obedience is intimately related to assurance; if we do not live and practice righteousness we have no reason to think that we are ‘born of God’. Again, Jesus said, ‘If you love me, keep my commandments,’ (John 15.10) not, ‘To be a spiritual Christian keep my commandments’, for obedience is for all disciples. ‘Follow holiness, without which no man shall see the Lord’ (Hebrews 12:14). ‘Though he were a Son, yet learned he obedience by the things which he suffered; and being made perfect, he became the author of eternal salvation unto all them that obey him’ (Hebrews 5:8, 9). ‘But as he which hath called you is holy, so be ye holy in all manner of conversation, because it is written, Be ye holy; for I am holy'(1 Peter 1:15, 16). The Bible makes it crystal clear that there is a close relationship between assurance and obedience; but the ‘carnal Christian’ teaching gives assurance to those who are at home in the realm of sin. They are classed as Christians. Many times this is a false and damning assurance because such have no biblical reason to believe that they are Christians at all. Sixth: The fruits of this teaching are not new to Christianity even though the teaching appears on the present scene under a new mask. It is the old doctrine of Antinomianism. Paul attacks this in Romans 6:1, 2 when he asks, ‘What shall we say then? Shall we continue in sin that grace may abound? God forbid…’ By implication, the answer of the three-category teaching to Paul’s question is, ‘Yes, you can continue in sin and be a carnal Christian’. And that is Antinomianism! Seventh: ‘carnal Christian’ teaching is the mother of many second work-of-grace errors in that it depreciates the biblical conversion experience by implying that the change in the converted sinner may amount to little or nothing. It goes on to say that the important change which affects a man’s character and conduct is the second step which makes him a ‘spiritual Christian’. Eighth: The ‘carnal Christian’ teaching is also the mother of one of the most soul-destroying teachings of our day. It suggests that you can take Jesus as your Savior and yet treat obedience to his lordship as optional. How often is the appeal made to the so-called ‘carnal Christians’ to put Jesus on the throne and ‘make him Lord’! When they accept Jesus as Lord, they are told, they will cease to be ‘carnal Christians’. But such teaching is foreign to the New Testament. When our Lord appeared in human form in history the angel announced his coming in the words, ‘For unto you is born this day in the city of David a Savior, which is Christ the Lord’ (Luke 2:11). He cannot be divided. The Savior and Lord are one. When the apostles preached they proclaimed Christ to be Lord. To bow to his rule was never presented in the Bible as a second step of consecration. ‘For we preach not ourselves, but Christ Jesus the Lord; and ourselves your servants for Jesus’ sake’ (2 Corinthians 4:5). When sinners truly receive him they do receive him as Lord. ‘As ye have therefore received Christ Jesus the Lord, so walk ye in him’ (Colossians 2:6). Ninth: This teaching breeds Pharisaism in the so-called ‘spiritual Christians’ who have measured up to some man-made standard of spirituality. There ought to be no professed ‘spiritual Christians’, much less ‘super-spiritual’ ones! George Whitefield, a man who lived very close to his Savior, prayed all his days, ‘Let me begin to be a Christian’. And another Christian has truly said: ‘In the life of the most perfect Christian there is every day renewed occasion for self-abhorrence, for repentance, for renewed application to the blood of Christ, for application of the rekindling of the Holy Spirit’. The ‘carnal Christian’ teaching is, after all, the consequence of a shallow, man-centered evangelism in which decisions are sought at any price and with any methods. When those pronounced to be converts do not act like Christians, do not love what Christians love, and hate what Christians hate, and do not willingly serve Christ in his church, some explanation must be found other than calling upon them to ‘decide’ for Christ. They have already done that and have already been pronounced by the preacher or personal worker to be ‘Christians’. But when they don’t act like Christians something is wrong. What is it? The teaching I have sought to answer says that the trouble is that they are just ‘carnal Christians’; they have not made Christ ‘Lord’ of their lives; they have not let him occupy the throne of their hearts. Once this explanation is seen to be unscriptural it will also be seen to be closely connected with an initial error over evangelism itself. Too often, modern evangelism has substituted a ‘decision’ in the place of repentance and saving faith. Forgiveness is preached without the equally important truth that the Spirit of God must change the heart. As a result decisions are treated as conversions even though there is no evidence of a supernatural work of God in the life. Surely the best way to end this evil is to pray and labor for the restoration of New Testament evangelism! Whenever such evangelism exists it is certain that men will learn that it is not enough to profess to be a Christian, and not enough to call Jesus ‘Lord, Lord’ (Luke 6:46). The gospel preached in awakening power will summon men not to rest without biblical evidence that they are born of God. It will disturb those who, without good reason, have believed that they are already Christians. It will arouse backsliders by telling them that as long as they remain in that condition the possibility exists that they never were genuine believers at all. And to understand this will bring new depths of compassion and urgency to the hearts of God’s people in this fallen world. One of the greatest hindrances to the recovery of such preaching is the theory we have considered. To reject that theory is to be brought back to a new starting-point in evangelism and in the understanding of the Christian life. It is to bring God’s work into the center of our thinking. It is to see afresh that there are only two alternatives — the natural life or the spiritual life, the broad way or the narrow way, the gospel ‘in word only’ or the gospel ‘in power and in the Holy Ghost’ (1 Thessalonians 1:5), the house on the sand or the house on the rock.